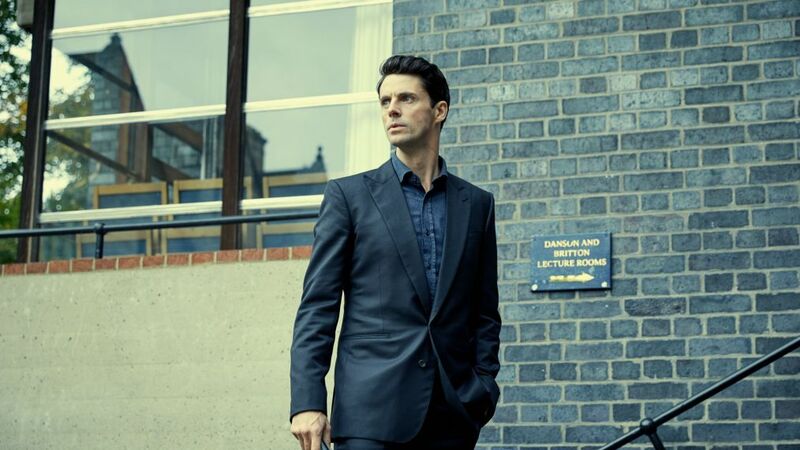 Nobody is surprised that actor Matthew Goode knows how to give a steely gaze in the new drama A Discovery of Witches, which is now streaming its first season on Sundance Now and Shudder. But, as the actor told us in an interview posted here last week, he owes that ability more to being a parent than anything else. However, during our chat recently at London's SoHo House, the actor also dug deep into his stepping into the shoes of a vampire for the series, and explaining the undeniable attraction between his bloodthirsty genealogist Matthew Clairmont and the historian-who-also-happens-to-be-a-powerful-witch, Diana Bishop (Teresa Palmer). No surprise that vampires and witches co-mingling in any capacity is a big no-no in this world! He says he was skeptical about the role until he read the script. Also, in the following continuation of our chat, he talked about being a part of period dramas like The Crown and Downton Abbey (yes, of course we asked about his role in the upcoming big-screen version!). What was the appeal of the project for you, given you're new to this fantastical genre? Matthew Goode: I went and met Jane Tranter, our phenomenal producer with a great track record, and she gave me the most fantastic 10-minute [summary] of a very dense, complicated book. She really fleshed out all the characters and how things work, and it sounded fascinating. Also, the fact that it was a trilogy because, I thought, if we do well, then we get to continue with the story. There’s something quite nice about the idea of sitting in a character for quite a long time, and one that changes as far as his manner and his makeup throughout that story. I thought it would be a great challenge as an actor. And, really, that’s kind of what you want. Does meeting Diana change him as a person? Yes, considering that vampires and witches don’t get along, famously, and haven’t for centuries. I think it starts out that he wants to get the Book of Life, and that’s his main target, because, obviously, creatures are dying out. Much of the series rests on the chemistry between you and Teresa. Going into filming, do you work on that or just kind of hope it pans out? I guess that’s sort of out of our hands, slightly. It’s quite mythical, this thing of chemistry. The cynical side of me would say, “You turn up and do your lines, I think you can get two actors together.” You’ve seen things before where two actors are actually together [in real life] and it falls flat on the screen! But the minute Teresa and I got together in the room, we just started having a real laugh. Australian and English people aren’t moons apart, as far as sense of humor and everything else, and we both have children...any time you start talking about your children with someone else, you have a massive connection. Is the whole first season him trying to get this book? That seems like the start of the season, at least. This book has been missing for centuries, but why did it present itself to this witch, a witch without power? Teresa’s character is very much the center of the story. And then it’s about this centuries-old feud between vampires and witches. They start being chased, and then there’s a covenant -- it’s a lot of forbidden stuff happening, and a lot of magic. It’s great! Tell me about Miriam (Aiysha Hart) and Marcus (Edward Bluemel), who seem to be Matthew's crew. Matthew sired Marcus, we find out, and that was really during the war of independence in America. Marcus is a bit of a rockstar, but also a teenage son at the same time, so he’s constantly annoying me, but he’s got a great heart, and there’s sort of a weakness and fragility to Marcus. Miriam’s actually older than any of them — she’s 3,000 [years old]. So, although she looks like a model, she’s actually more like a grandma, really! She’s actually keeping Marcus and Matthew in check. She’s also my go-to, my confidante, and right-hand lady, as far as the genealogy of working in the lab. Well, at the start she doesn’t understand it, and she’s quite happy with her lot, really. She’s a historian, she’s smart as hell, she’s very academic and brilliant, but her magic scares her a bit, because it comes at these inopportune moments, and the last thing she wants to do is draw attention to it. Does Matthew want her to get more powerful, or is it more beneficial to him that she not be aware of how strong she is? Well, certainly when they first come together, he wants the book, and he’s intrigued by it. And then — when they become slightly more entangled but when he takes her DNA and finally analyzes it and finally understands it — he realizes she’s one of the most powerful of all time. So he wants her to get to her zenith, I think. There are, of course, stereotypes to vampires. Does this show embrace some of those, or does it kind of stay away from them? Yes, there are some stereotypical bad people and stereotypical good people, but hopefully, what the payoff will be is that we’re playing with those stereotypes. Right now, they seem very much one way; hopefully they will be flipped. I haven’t personally read book two myself yet, so I’m looking forward to seeing where the story goes! As an actor, what is your approach to a role like this? Is it the same for every project, or do you have to fine-tune things? It’s easier and harder. You really just have to throw yourself into the element of living in a world where magic exists. It’s very easy to write magic, especially when you’re doing a Harry Potter, where there’s over a million-dollar budget, and you can really make things happen. And ours is done brilliantly, so you really have to throw yourself into it. But it’s the same as anything else, you’re trying to find your emotion through a character -- he might be a vampire, but love is love. The whys and hows of everything are always the same, thankfully. And I rely hugely on the person I’m with in the scene, always, because I don’t know what they’re going to do until they do it. That’s the fun bit. I guess it’s like being a musician when you’re always having a jam with someone. When you were on The Crown [as Antony Armstrong-Jones], you were playing a real person. Are there unique challenges to that? It sounds awful, but there was part of me that was glad — well, not glad — but that he died just before I started. I did feel like, “Well, at least if I do mess it up, I’ll never get an angry letter from him.” But maybe I’ll get one from his extended family. But it was an incredible amount of fun to play him. I felt slightly cut short, because obviously they then moved on with a whole new cast [for the show's third season]. It was a bit of a shame; I remember speaking to Peter Morgan, the writer, and he was like, “I’ve just written the most amazing scene for the next series!” and I was like, “Well, I’m thrilled for whoever’s going to be playing that part at that point.” [laughs] I didn’t know it was Ben Daniels at that point, so when the photo came out, I was like, “He looks amazing!” I mean, he’s just got that thing. But I miss working with Vanessa [Kirby, who played Margaret], because — and I think she would say the same — what we got was really good. It could have possibly been even better if we weren’t laughing so much! She’s just brilliant. It’s funny as well, because I was warned that Vanessa chews people up onscreen and throws them around and spits them out. I don’t know what I thought I was meeting when I first got to set. And then, we just found it really easy. And now, the Downton Abbey fanbase, I’m sure, is just chomping at the bit for the upcoming movie. Anything at all you can say? They’re gonna get a host of new faces. All I can say is it was lovely to see everyone again. Everyone came back. It’s infectious being around them again, you know. You’re sitting there, and you’re watching Maggie [Smith] and everyone do their thing. It’s brilliant. And find out its release date! A Discovery of Witches, Season 1 now streaming on Sundance Now and Shudder. Seasons 2 & 3 have been greenlit by Britain's Sky UK and acquired for U.S. streaming by Sundance Now and Shudder. Airdates TBD.